Data Center technologies and practices are helping cannabis grow facilities minimize IT equipment and infrastructure failures. Risk of massive crop value loss drives interest and investment from growers. Data Center investments also help growers improve speed to market, energy efficiency, and effective seed-to-sale tracking. We’ve found that as the Cannabis Grow industry is expanding, it’s looking to our extensive critical facility knowledge and expertise to scale"
PlanNet’s Michael Fluegeman and Jim Strano will be sharing real world examples of how the Cannabis Grow Industry is applying technology and strategies from Data Centers at Data Center World (March 19-22, 2019, Phoenix Convention Center, Arizona). Cannabis grow facilities utilize rapidly evolving technology, much of which is familiar to the data center industry. 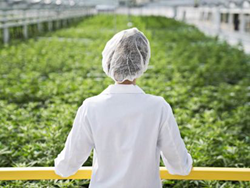 “Grow facilities face many of the same challenges as other more traditional and established critical facilities. So it’s not surprising that many of the technologies and practices from data centers cross over to benefit the sector,” according to Michael Fluegeman, PE, Senior Engineer, Principal at PlanNet. We’ve found that as the Cannabis Grow industry is expanding, it’s looking to our extensive critical facility knowledge and expertise to scale,” according to Jim Strano, VP, Critical Facilities & Design at PlanNet. Data Center technologies and practices are helping grow facilities minimize IT equipment and infrastructure failures that can result in hundreds of thousands dollars of crop value loss. Technologies and practices considered essential in the Data Center space also help growers improve speed to market, energy efficiency, effective seed-to-sale tracking for regulatory compliance, and security, allowing them to drive overall business performance and increase the bottom line. PlanNet is an independent professional services firm that provides objective advisory, design, project management and implementation services to both private and public-sector organizations. PlanNet’s diverse, rapidly growing client list includes global, Fortune and middle-market companies and institutions across the United States and abroad. The firm’s experienced and highly skilled team of technologists, engineers, project managers and construction professionals support a broad variety of clients with engagements ranging from IT infrastructure and enterprise systems, to workplace technologies and all aspects of critical facilities, including construction. Founded in 2001, PlanNet is headquartered in Brea, California.